Recently a family friends dog got into raisins while they were out. They were so worried about what would happen to the dog. 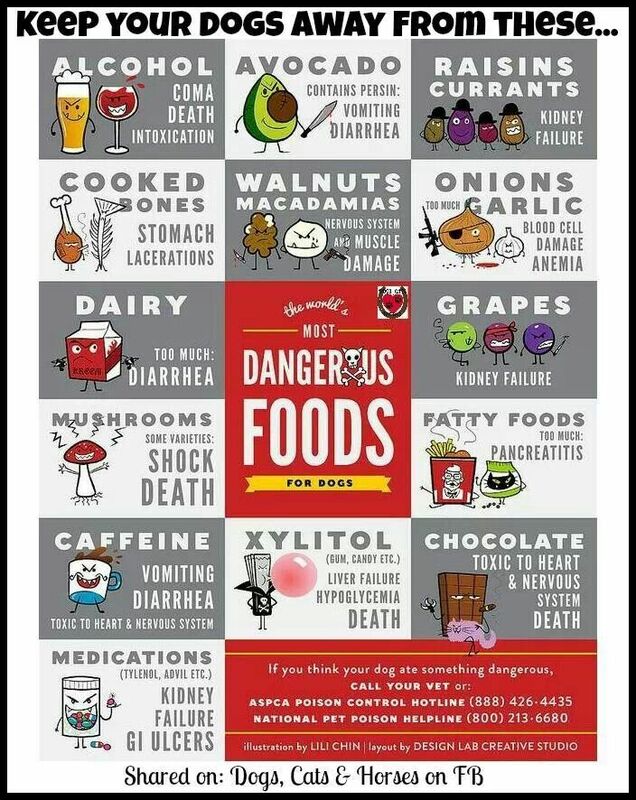 So that inspired me to take a few minutes to get the word out about what foods are dangerous and toxic for dogs! Please take a moment to read though this list and take the appropriate precautions at home. Avocados: Avocados contain “persin” which in large amounts is toxic to dogs. Alcohol: Alcohol has the same effect on dogs livers and brains as humans. Onions and Garlic: powered, raw, and cooked can destroy Red Blood Cells and lead to Anemia. You even have to be award if onion or garlic are an ingredient in food. Caffeine: In large amounts from tea, coffee, cocoa, chocolate, colas and energy drinks it can be fatal. Symptoms include restlessness, rapid breathing, heart palpitations, muscle tremors, fits, and bleeding. Grapes and Raisins: Grapes and raisins can cause kidney failure. Milk and Ice Cream: On a hot day these can cause digestive problems and diarrhea. Macadamia Nuts: As few as 6 nuts can kill a dog. These nuts can lead to muscle tremors, weakness or paralysis, vomiting, elevated body temperature, and rapid heart rates. Candy and Gum: Candy, gum, toothpaste, baked goods, and some diet foods are sweetened with xylitol. Xylitol can lower blood sugar and lead to liver failure. Chocolate: all kinds of chocolate contain theobromine. The most dangerous kinds, though, are dark chocolate, chocolate mulch, and unsweetened baking chocolate. Eating it can cause a dog to vomit, have diarrhea, and be excessively thirsty. It can also cause abnormal heart rhythm, tremors, seizures, and death. Fat Trimmings and Bones. Table scraps can cause pancreatitis. Many bones from chicken become a choking hazard and can obstruct or lacerate intestines. Peaches, Plums Persimmons: the pits or seeds can cause in inflammation or obstruction in the intestines. These pits also contain cyanide that is poisonous to dogs and humans. Raw Eggs: Eggs can carry Salmonella or E. coli plus they also have an enzyme that will interfere with absorption of Vitamin B. Raw Meat and Fish: Bacteria from meat and fish can cause food poisoning. Acetaminophen or Ibuprofen: Never give your dog over the counter medicines unless directed by your Veterinary. They are poisonous and can kill a dog. Baking Soda and Baking Powder: These are toxic to a dog. If you think your dog has swallowed one of these items check their mouths first. It is a smart idea to always keep the number of your local Veterinary handy! Also keep the name and location of the local emergency Veterinary Clinic with this number. Always keep the number of the ASPCA Animal Poison Control Center handy! . (888) 426-4435 — where you know you can find them in an emergency. And, if you think your dog has gotten into something toxic, call for emergency help at once. And most important if you take anything away from reading this, is PLEASE HELP SPREAD THE WORD!!!!! I also want to ask you all, what other topics would you like me to talk about? I hope to hear from you.